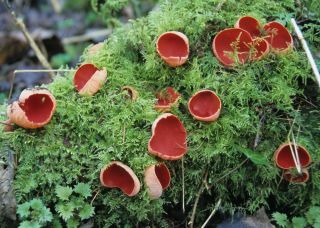 A stroll in the woods around Southstone Rock in the Shelsleys from early February to early April reveals copious amounts of a conspicuous bright red fungus called Scarlet Elf Cap. I mention this site specifically for this common early spring fungus, owing to its sheer abundance here close to pathways and by the stream. Over the past few years I have found upwards of 400 specimens scattered on twigs and branches lying on the ground, chiefly of ash but also goat willow, wych elm, and poplar, usually lying amongst the mosses Bracythecium rurabulum and Eurychium praelongum. Now it was generally accepted that this Elf Cap was Sarcoscypha coccinea but recent research (see Butterfield & Spooner, Mycologist, volume 9, part 1, February 1995) has shown that an almost identical species Sarcoscypha austriaca is more common. In the field they appear the same (clustered, irregularly cup-shaped, 2-8cms wide) but under the microscope differences are more apparent. Firstly, both species have tiny whitish hairs on the ‘outside’ of the cup (excipular hairs). In S. coccinea the hairs are straight or slightly sinuous while in S austriaca they are strongly sinuose or corkscrew-like, distinct under the microscope (Figure 1). Secondly, the spores are slightly wider in S. austriaca (11-14 µm) than in S. coccinea (9-12µm). Also in S. coccinea they are mostly rounded at the ends, whilst in S. austriaca they are mostly truncated (Figure 2). Their habitats and occurrence are the same and in some localities around Bristol I have found them cohabiting. Rest assured that from recent sample identifications from Southstone Rock all specimens have keyed out as S. austriaca – reassuring for those without microscopes who may encounter these fungi in the Shelsleys!